Any help identifying these two would be much appreciated! They were inherited from my grandmother and probably date from the beginning of the 20th century. They have been in a closet for years and should probably go to someone who will appreciate them. 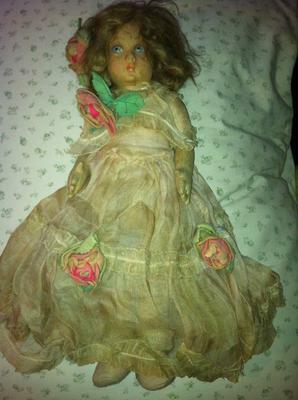 I'm really not knowledgeable about dolls and can find NO MARKS AT ALL, though there is a very faint 3 on the foot of the doll in the short satin dress. Is this composition? It's not shiny at all. Everything looks hand sewn together. Again, I know nothing about dolls! Thanks anyone who sees this and can help. SORRY, SITE WILL NOT LET ME UPLOAD MORE PHOTOS. PLEASE POST YOUR EMAIL ADDRESS OR SOME MEANS OF CONTACTING YOU IF YOU WISH TO SEE PHOTOS OF THE SECOND DOLL. 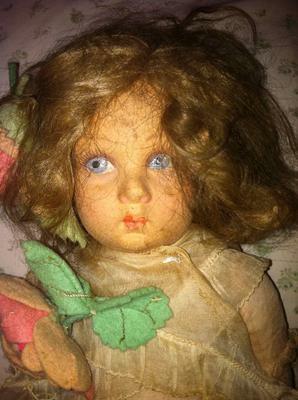 This looks to me like a Rita or Lucia face Lenci doll. This one looks like its from the 1930s. 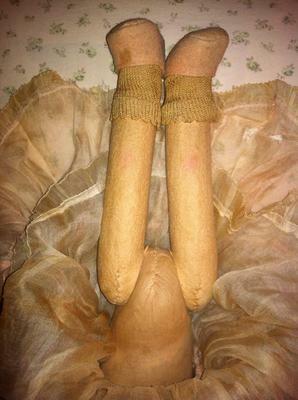 They have felt faces, arms and legs, hand painted features and these sweet dolls were made in Italy. There is much more information then I can fit here, online. Shes adorable.